Andy Murray’s first win in almost a year, his second match back after hip surgery and a truly impressive first-set performance. Another major milestone has been passed. Murray needed only 77 minutes to get the better of Stan Wawrinka 6-1, 6-3 in the warm summer sun, moving with surprising ease into the second round of the Nature Valley International at Devonshire Park. But before the Wimbledon bandwagon starts rolling, Murray wanted to put the brakes on it. He has won a match in Eastbourne but there is still a long way to go before he makes any decisions on playing in SW19. A week ago when he faced Nick Kyrgios at Queen’s, he had taken his time to warm up, he needed more than a few games to trust his movement. But yesterday, he was sharp, focused and aggressive. And he was far too good for Wawrinka, who is still coming back from injury problems of his own. 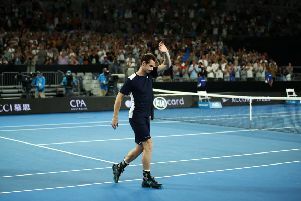 Apart from the eighth game of the second set when Murray faced his only break points of the match (four of them, all saved), there was little Wawrinka could do to stop Murray’s march to an appointment in the next round with Kyle Edmund, the Englishman who has usurped him as British No 1. Last summer Wawrinka had two operations on his left knee and his return to fitness has been as slow and as frustrating as Murray’s. After he had been broken in the first set, the Swiss knew he was in trouble. “I cannot f*****g move one step!” Wawrinka growled and then smacked his racket into his bag at the change of ends. This was not to be his day. Murray, meanwhile, was being as aggressive as seemed sensible – a new tactic as he makes his way back to peak form and, he hopes, a decent ranking. The big question, of course, is how his hip – and the rest of him – reacts to yesterday’s efforts and how ready he will be for the next encounter. Wawrinka in the first round and Edmund in the second is the draw from hell for anyone looking to bank a few ranking points but Murray knows that this will be his life for the coming few months. “I was saying to my team before the draw, I basically have no ranking now after Wimbledon,” Murray said. “I would have had zero points, I wouldn’t have been on the computer so you can’t control who you draw. “I looked at someone like [Juan Martin] Del Potro’s comeback from multiple injuries and some of the draws you get are really difficult and you just have to try and accept it, try and deal with it the best you can and hopefully start winning some of those matches soon. As for the hip, he is hoping that 77 minutes of play will take less time to recover from than the two hours and 39 minutes he had against Kyrgios. He was sore after that first match; this time should be a bit easier.